This tutorial provides insight into Microsoft.Photos.exe process, including the possible adverse effects it may cause and ways to fix those on a Windows 10 PC. Microsoft.Photos.exe is a process behind a software package shipping with new versions of Windows operating system. It is located in the WindowsApps directory under Program Files on the hard drive’s system partition. The tool is tasked with creating thumbnails for stored images and allows users to make photo albums. Whereas it is a legit executable arriving with one of the recent OS updates, numerous users have been reporting problems that revolve around it. One of the biggest concerns is that it consumes too much CPU power and disk input/output for a process that’s not always in use. As a result, the computer will slow down and be heating up all the time. Such an influence isn’t welcome regardless of an application’s origin. One more concern about Microsoft.Photos.exe is that some security suites may flag it as a malicious entity, which isn’t really a false positive. Based on the heuristic detection features of these antimalware tools, the process under scrutiny looks suspicious as it doesn’t have a known-valid signature and the publisher information cannot be verified. Furthermore, it communicates to the Internet via TCP protocol and receives data from an external server behind the admin’s back. Unless the user adds an exclusion to the configuration of their AV solution, it will keep on blocking the executable in the following path: C:\Program Files\WindowsApps\Microsoft.Windows.Photos_15.1001.16470.0_x64__8wekyb3d8bbwe\Microsoft.Photos.exe. There have been some speculations about said program being malware or even ransomware. That’s not quite true. It does exhibit signs of malicious behavior, though, perhaps inadvertently. To top it off, there is a great deal of system performance deterioration associated with its activity. The machine may have scarce resources left to cope with trivial tasks, and even launching programs or installing new ones may turn into a really cumbersome experience. What makes matters worse is that uninstalling Microsoft Photos isn’t as easy as one might anticipate. This is doable as follows: type ‘powershell’ (without quotes) in Windows search, right click the Windows PowerShell entry and select ‘run as administrator’ mode. 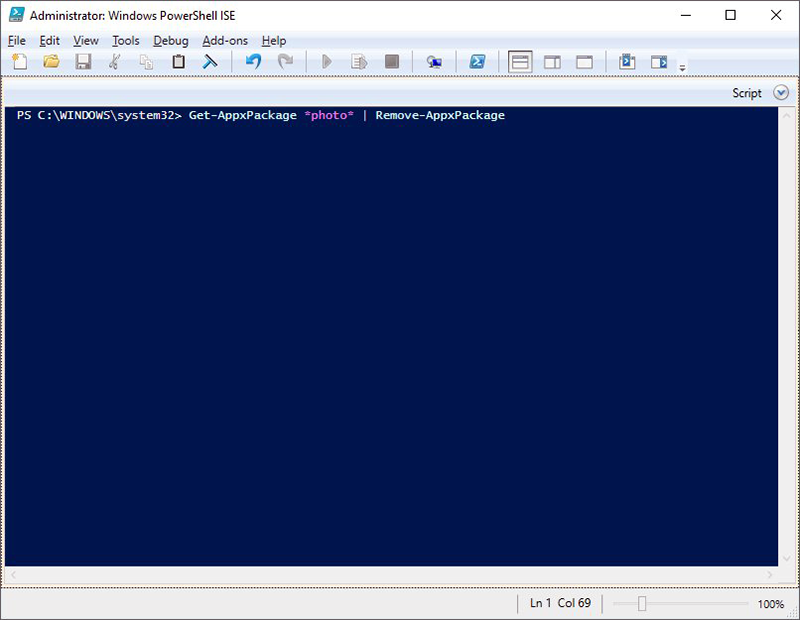 Then, enter the following command in the PowerShell console: ‘Get-AppxPackage *photo* | Remove-AppxPackage’ (see screenshot below) and hit Enter. The system will display a ‘Deployment operation progress’ notification denoting that the Microsoft.Photos.exe program is being uninstalled. When this message disappears, it means the removal routine has been completed and the application shouldn’t be causing trouble anymore. If this technique doesn’t work out for some reason, be sure to use the cleanup method below. Thanks a lot! It seems to be gone!